Who is MP-14? Could it be Masterpiece Ultra Magnus which Mr Starscream alluded to last year? Or is it another character entirely? TakaraTomy has revealed a new exclusive Shining B2 micron for Tokyo Toy Show 2012. This is a translucent version of the B2 Micron from Arms Micron Bumblebee. Take a closer look at it by clicking the thumbnail. Featured Ebay Auctions - A Little "Whoah"
Some cool items for the high rollers out there. Our Featured Ebay Auctions have a few items that would be the centerpiece of nearly any collection. Check them out below. Hasbro has just posted up new images of the upcoming Transformers 2012 SDCC Exclusives. View in and out of package shots for Bruticus and Cliffjumper. More Transformers SDCC 2012 Bruticus Gift Set Fall of Cybertron & Cliffjumper after the jump. Hasbro has just posted up new images of the upcoming GIJOE SDCC Exclusive ShockWave H.I.S.S. Tank. The new box sports old school Marvel style comic book art to match last years SkyScream with Cobra Commander. The ultimate Transformers saga begins here! More Than Meets The Eye reunites the fan-favorite creative team behind Last Stand of the Wreckers and sends the Transformers on an epic quest to the farthest reaches of the Transformers Universe and beyond! Also includes the one-shot Death of Optimus Prime. Check out the cover image by clicking the title bar. The Fall of Cybertron news continues to roll in! Check out these two new videos of footage posted on Gamespot's Youtube page of Optimus and Warpath teaming up and of Starscream planting EMP's on his foes! The Fall of Cybertron news continues to roll in! Check out this footage posted on Gamespot's Youtube page of Optimus and Warpath! 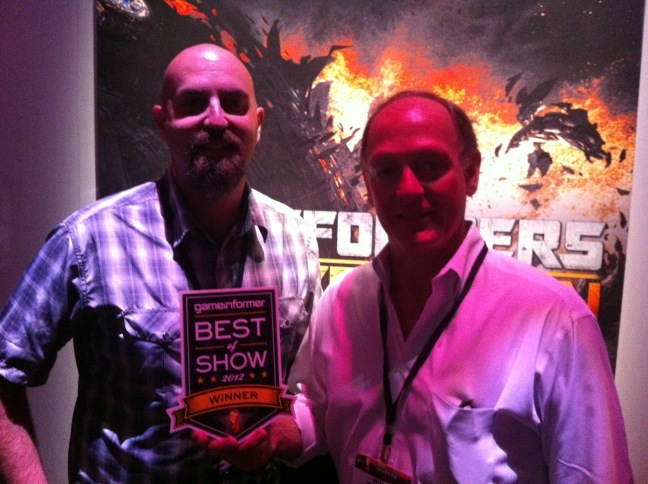 Transformers: Fall of Cybetron has been awarded E3's Best of Show 2012 by Game Informer. TFcon is pleased to share with you the first image of the TFcon 2012 exclusive SHAFTER figure in package featuring box art by Silas Zee. Limited to only 500 pieces it is produced by iGear Toys. You can reserve the TFcon exclusive Shafter and register for TFcon 2012 via the online registration page. TFcon 2012 features Canada's largest dealer room for Transformers merchandise, question and answer panels and autograph sessions with many special guests including Transformers Creator Bob Budiansky, Transformers voice actor Scott McNeil, artist Silas Zee and Hasbro Canada with more to be announced. The official Transformers Facebook page has updated with a bevy of new images of the upcoming second assortment of Kre-O Transformers sets. Subtitled "The Quest for Energon" the sets will add many new sets to the line, including an awesome four robot version of Devastator, an Optimus Prime VS Megatron two-pack plus a Knock Out VS Wheeljack one, Vortex, Stealth Bumblebee, plus two sets of Kreons with little bases - one set featuring Cliffjumper and a trio of Vehicons, the other featuring a trio of Autotroopers! Click on that link above and check them all out. As announced on their E3 2012 Presentation, Nintendo has posted gameplay footage of some upcoming Nintendo titles for their “E3 All-Access” site update. Among the games is Transformers: Prime - The Game. Check out the footage for Transformers: Prime - The Game and many other games at Nintendo E3 2012 All-Access. Missing Transformers action now that Transformers Prime is on a break? Well, fear not! Those loveable Rescue Bots have you covered i nthe mean time as new episodes are on the horizon. The next new episode which is set to air on June 30 is titled The Lost Bell. The episode description from Zap2it is - A storm strands Cody on a deserted island where they find a pirate ship that holds the key to a mystery. More Fall of Cybertron footage continues to roll in from E3. Check out these two in game footage videos courtesy of Gametrailers.com featuring Vortex and Grimlock in action. Watch the end of Grimlock's video for a nice nod to the 1986 original Transformers movie! We are being assaulted with Transformers: Fall of Cybertron content from E3 2012. This time, IGN takes their time to talk with the Game Director; Matt Tieger. The demonstration contains more than what we’ve seen recently when it comes to gameplay and you can listen to what Matt has to say about it. An interesting snippet from a larger article on Transformers the Ride posted on LATimes' Hero Complex gives a small insight into what lies in store with Transformers 4. Apparently Transformers 4 will feature a redesign of the robots and an entirely new (human?) cast. Michael Bay has also said that he intends for this movie to be his last, to set things up for "the next guy". Granted, we have heard that before, because in the production of Transformers Dark of the Moon, Michael Bay had stated he intended that to be his last, and even before that, during Revenge of the Fallen Mr Bay had said he intended to take some time out before making the third movie. Neither of these possibilities materialized, so take this claim that Transformers 4 will be his last one with a pinch of salt. That being said, how does a redesign of the robot cast grab you? Dark of the Moon already featured a move to more "heroic" proportions on Optimus Prime with his new abs - will it be a case of more tweaking of designs familiar to audiences the world over, or perhaps a more dramatic shake-up? Be sure to check out the full article on LATimes. While it is mostly about Transformers the Ride, it is well worth the read for the information on the reception to the ride as much as it is for the hint at Transformers 4 taking a different direction. This is not very surprising news after Nintendo’s cool presentation at E3 yesterday. It seems like Transformers: Prime - The Game is coming to Nintendo WiiU. We’ve known that the game would release on Fall for Nintendo Wii, DS and 3DS, but this is the first official announcement of the game for the Wii successor. You can find out more by visiting the Activision Official Website (Find Games > All Platforms > WiiU). "Help Optimus Prime and the AUTOBOTS join forces with human friends Jack, Miko and Raf to save the Earth from Megatron and his new secret weapon. Play as one of your favorite AUTOBOT characters including Bumblebee and Bulkhead as you battle through unique vistas around the world to help defeat the DECEPTICONS. Continue the battle on the Wii and 3DS systems against your friends in Multiplayer Mode with 12 playable characters." We have received the Diamond Comics shipping list for next week's Transformers comics courtesy of 2005 Boards member D-Drive. Robots In Disguise #6 will give us a glimpse of where Optimus has been while the More Than Meets The Eye trade paperback will be perfect for new readers wanting to jump in on this new story from the beginning!